The Neil Gehrels Swift Observatory carries three instruments to enable the most detailed observations of gamma ray bursts to date. Two of these instruments, the X-ray Telescope (XRT) and the UV/Optical Telescope (UVOT) were built by Penn State and collaborators at Leicester University and the Mullard Space Science Laboratory (both in England) and at the Osservatorio Astronomico di Brera (in Italy). In addition, Penn State is responsible for leading the Education and Public Outreach component of this mission, as well as the Mission Operations Center, which operates the satellite. The three coaligned instruments are known as the BAT, the XRT, and the UVOT. 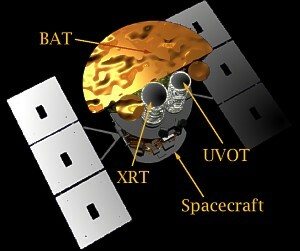 The XRT and UVOT are X-ray and a UV/optical focusing telescopes respectively which produce sub-arcsecond positions and multiwavelength lightcurves for gamma ray Burst (GRB) afterglows. Broad band afterglow spectroscopy produces redshifts for the majority of GRBs. BAT is a wide Field-Of-View (FOV) coded-aperture gamma ray imager that produces arcminute GRB positions onboard within 10 seconds. The spacecraft executes a rapid autonomous slew that points the focusing telescopes at the BAT position in typically ~ 50s. The positions and images derived by the various instruments are sent as soon as they are available from the spacecraft via the TDRSS system to the Gamma Ray Coordination Network (GCN). The GCN broadcasts the results to the world via the Internet for rapid response by the world astronomy community for follow up observations by other ground and space based telescopes. At the next satellite pass over Malindi, the more detailed data is sent to the data center where it will be processed for public access within 30 minutes of the pass.